Read about Lumbar Radiculopathy Symptoms and Treatment. Lumbar Radiculopathy exercise and spondylosis. Cervical radiculopathy. Radiculopathy is a pinched nerve in the spine. It occurs when surrounding bones, cartilage, muscle, or tendons deteriorate or are injured. The trauma causes these tissues to change position so that they exert extra pressure on the nerve roots in the spinal cord. Nerves control sensations and movement in the body. Lumbar radiculopathy is a painful condition that happen when a nerve in lumbar spine (lower back) is pinched or irritated producing pain, tingling, numbness, and/or weakness going into the leg. 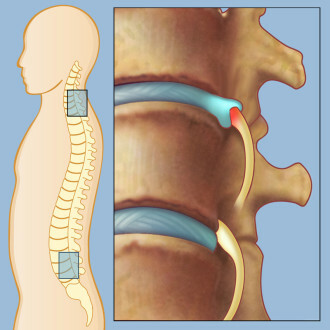 Lumbar radiculopathy is a disorder of the spinal nerve root from L1 to S1. It can cause sciatica, or shooting pain in the legs. Incontinence, sexual dysfunction, or severe paralysis can also occur in severe cases. Lumbar radiculopathy is caused by compression or irritation of the nerves as they exit the spine. This can be due to mechanical compression of the nerve by a disc herniation, a bone spur (osteophytes) from osteoarthritis, or from thickening of surrounding ligaments. As people age, their spines are subject to increasing degeneration (increased tearing of the disc) which can cause herniated discs and similar problems leading to lumbar radiculopathy. Other less common causes of mechanical compression of the nerves is from a tumor or infection. Either of these can reduce the amount of space in the spinal canal and compress the exiting nerve. Scoliosis can cause the nerves on one side of the spine to become compressed by the abnormal curve of the spine. The clinical presentation of lumbar radiculopathy will vary depending on the cause of the radiculopathy and which nerve roots are being affected. Patients will often present with pain in the lumbar region that radiates through one or both legs. This pain is often described as burning, stabbing, or shooting. For this pain to be considered radiculopathy, however, neurological signs must be present such as weakness, numbness, or reflexive changes. Medical management includes patient education, medications to relieve pain and muscles spasm, cortisone injection around the spinal cord (epidural injection), physical therapy, anti-inflammatory medications, or chiropractic treatment, and avoiding activity that strains the neck or back. Physical therapy: Physical therapy treatment plan include mild stretching and pain relief modalities, such as ultrasound, massage, ice and heat pack therapy, electrical stimulations like TENS, active stabilization, laser therapy, conditioning exercise and ergonomic program. Rest:Activities that aggravate the pain should usually be limited. Physicians can prescribe a splint, brace, or soft collar to immobilize the affected area. This helps to facilitate rest. In extreme cases, bed rest or traction may be necessary. Medications: medications such as non-steroidal anti-inflammatory drugs (NSAIDs) to reduce swelling and analgesics to relieve pain. Injections:Epidural steroid injections and nerve root injections to help reduce swelling and treat acute pain that radiates to the hips or down the leg. It is advised to undergo surgery to relieve pinched nerve or lumbar radiculopathy if condition has not improved with conservative management.